In a very general sense, increasing the hardness of a steel gear increases the strength of the gear. However, for each process there is a limit to its effectiveness. This article contains background information on each of the processes covered. In each section what is desired and what is achievable is discussed. Typical processes are presented along with comments on variables which affect the result. By reviewing the capabilities and processes, it is possible to determine the limits to each process. A carburized alloy steel gear has the greatest load-carrying capacity, but only if it is heat treated properly. For high quality carburizing, the case depth, case microstructure, and case hardness must be controlled carefully. Carburized and hardened gears have optimum load-carrying capability. There are many alternative ways to produce a hard case on the gear surface. Also, selective direct hardening has some advantages in its ability to be used in the production line, and it is claimed that performance results equivalent to a carburized gear can be obtained. This article examines the alternative ways of carburizing, nitriding, and selective direct hardening, considering equipment, comparative costs, and other factors. The objective must be to obtain the desired quality at the lowest cost. A widespread weakness of gear drawings is the requirements called out for carburize heat treating operations. 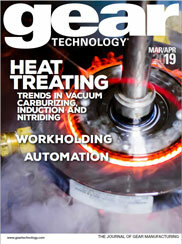 The use of heat treating specifications is a recommended solution to this problem. First of all, these specifications guide the designer to a proper callout. Secondly, they insure that certain metallurgical characteristics, and even to some extent processing, will be obtained to provide the required qualities in the hardened gear. A suggested structure of carburizing specifications is give. This paper presents how low pressure carburizing and high pressure gas quenching processes are successfully applied on internal ring gears for a six-speed automatic transmission. The specific challenge in the heat treat process was to reduce distortion in such a way that subsequent machining operations are entirely eliminated. Precise heat treatment plays an essential role in the production of quality carburized gears. Seemingly minor changes in the heat treating process can have significant effects on the quality, expense and production time of a gear, as we will demonstrate using a case study from one of our customer's gears. Graded hardening technology has proven over the years to yield very good results when used in the heat treating of carburized gears. It is especially advantageous for smaller companies, subject to higher competitive pressures. Unfortunately, despite the fact that graded hardening is a very well-known method, its use has been limited. We strongly recommend this technology to all of those who need to produce gears with high metallurgical quality. Single Piece Flow Streamlines Production for High-Volume Gear Manufacturers. Effective case depth is an important factor and goal in gas carburizing, involving complicated procedures in the furnace and requiring precise control of many thermal parameters. Based upon diffusion theory and years of carburizing experience, this paper calculates the effective case depth governed by carburizing temperature, time, carbon content of steel, and carbon potential of atmosphere. In light of this analysis, carburizing factors at various temperatures and carbon potentials for steels with different carbon content were calculated to determine the necessary carburizing cycle time. This methodology provides simple (without computer simulation) and practical guidance of optimized gas carburizing and has been applied to plant production. It shows that measured, effective case depth of gear parts covering most of the industrial application range (0.020 inch to over 0.250 inch) was in good agreement with the calculation. Acetylene with DMF solvent enables benefits of low-pressure vacuum carburizing. Heat treat alternative offers advantages over conventional methods. Open any heat treating journal today and you’re certain to find multiple references (articles, technical papers and/or advertisements) promoting low-pressure carburizing (LPC). The uninformed might breeze by these references thinking it’s the next flash-in-the-pan, but unlike in the past, this time the process has legs. High demands for cost-effectiveness and improved product quality can be achieved via a new low pressure carburizing process with high pressure gas quenching. Up to 50% of the heat treatment time can be saved. Furthermore, the distortion of the gear parts could be reduced because of gas quenching, and grinding costs could be saved. This article gives an overview of the principles of the process technology and the required furnace technology. Also, some examples of practical applications are presented. Often, the required hardness qualities of parts manufactured from steel can only be obtained through suitable heat treatment. In transmission manufacturing, the case hardening process is commonly used to produce parts with a hard and wear-resistant surface and an adequate toughness in the core. A tremendous potential for rationalization, which is only partially used, becomes available if the treatment time of the case hardening process is reduced. Low pressure carburizing (LPC) offers a reduction of treatment time in comparison to conventional gas carburizing because of the high carbon mass flow inherent to the process (Ref. 1). In this study, wear behavior of plasma and pulse plasma nitrided gears, made from 42CrMo4 steel, was evaluated under a lubricated sliding and pitting regime. This paper introduces new process developments in low-pressure carburizing and carbonitriding using either high-pressure gas quenching or interrupted gas quenching. Dana Corp. is developing a process that carburizes a straight bevel gear to a carbon content of 0.8% in 60 fewer minutes than atmosphere carburizing did with an identical straight bevel. ALD-Holcroft Vacuum Technologies Co. will host a two-day technical symposium at the Henry Ford Museum in Dearborn, Michigan September 23– 24, 2008. The proper control of distortion after thermal treatment of powertrain components in the automotive industry is an important measure in ensuring high-quality parts and minimizing subsequent hard machining processes in order to reduce overall production costs. The complete Events section from January/February 2005, including coverage of a vacuum carburizing conference. A study was conducted to isolate the influence of pre-rough machine processing on final dimensional distortion.